Coconut oil jars across Brooklyn are getting cloudy, hoodies are becoming a sensible choice, and the fog has moved in like a transplant - Summer is retreating. On a cool and humid Sunday night a gathering at Sunview Luncheonette hosted by Imani Elizabeth Jackson & Sean D. Henry-Smith (a.k.a. Peaches & Peas I’m coining this) for food and poetry. Imani and Sean are the epitome of millennial culture, their friendship only existed over Twitter where they would share their poems and sometimes discuss food. Then by chance, they meet overseas in London through mutual friends. A beautiful friendship supported by poetry and Black Southern food heritage was born. Sean prepared a sansho ricotta with sake marinated peaches and a variety of mustard greens. Imani prepared a sweet pea ice cream and croquettes from a George Washington Carver recipe. By the time I arrived Imani’s dish was already gone, but people weren’t shy about telling me how delicious it was. Sean’s dish I was lucky enough to sample; the sweetness of the peach paired well with the creamy ricotta, and the mustard greens a bold addition that cut through sweet and savoriness to round out the flavors. After much laughter and storytelling, the room got quiet as Imani and Sean grabbed a bottle of orange wine and made a small table the biggest stage. The two went back and forth each round increasing the risk in emotion and language; someone mentioned earlier that night the two were a Young Thug and Uzi Vert combo, they couldn't tell who is who. We are all given a body, and we have to feed it somehow. That’s what I left with after this superb dining and literary experience. I forgot how many stories we're telling when we cook food, and we make a table for others to join. Preparing a meal, writing a poem, performing your art is all well and good, but making space is a rarity. With enough practice, anyone can do what I’ve mentioned before, follow the recipe but there is no class you can take to do what these two did. 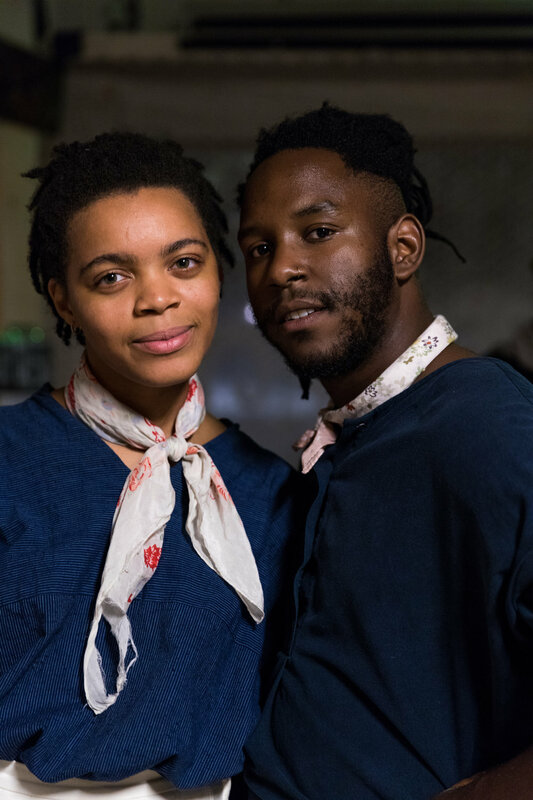 Imani and Sean created an environment of happiness and sincereness all the while opening themselves with how the food got to your plate by a poem. It’s an experience I wish more people were present for it’s an experience that I’ll never forget.